Only few ingredients are used in this curry. But it tastes the best. 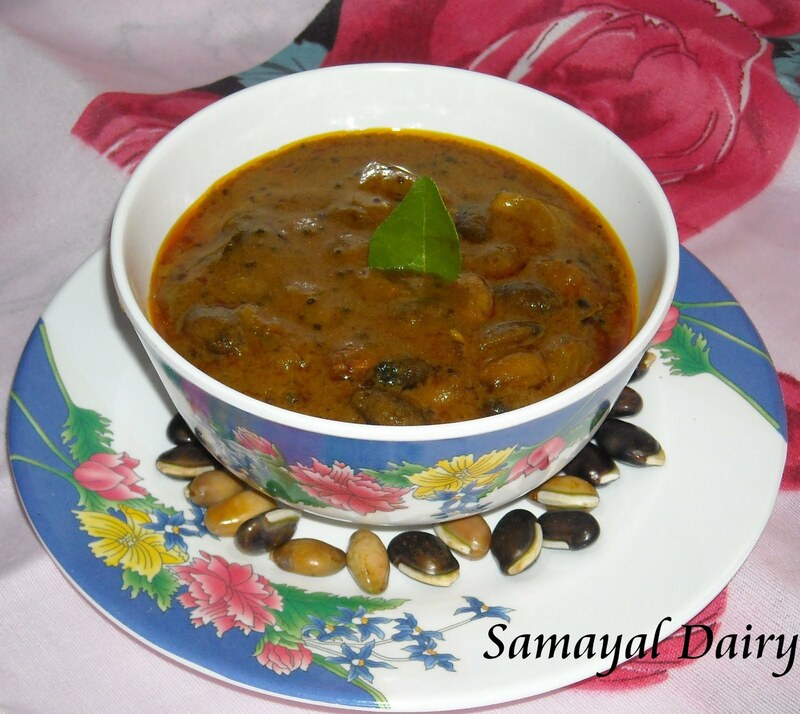 My Mom used to make this kuzhambu only with Mochai kottai, Sambar Powder and Coconut. She doesn’t add Tomatoes or Tamarind. She uses little more Oil and Pearl Onions than usual. I have tried this few times but when I made this today, It came out really perfect. Peel and chop Pearl Onions. Heat Oil in a Pan. Add Mustard Seeds. When they complete popping up, add the chopped Pearl Onions and Curry Leaves. When Onions turn slightly brown, add Mochai Kottai, Sambar Powder, Water and Salt. Mix well. Boil till the curry reduces and done. Serve with Rice and any Dry Curry/Poriyal. This goes well with Dosa too. Notes: Coconut Powder can be replaced by grated Coconut. Sending this recipe to Signature Recipes hosted by Saras’ Kitchen..
looks wonderful and perfectly done !! First time coming here...your dish make me to feel about my native where i can get fresh mochai paruppu and recipes. I remember my mom making this too often- nice one ! looks delicious ...gonna try today..